Instant downloads of all 942 LitChart PDFs (including Twelfth Night). New! Understand every line of Twelfth Night. 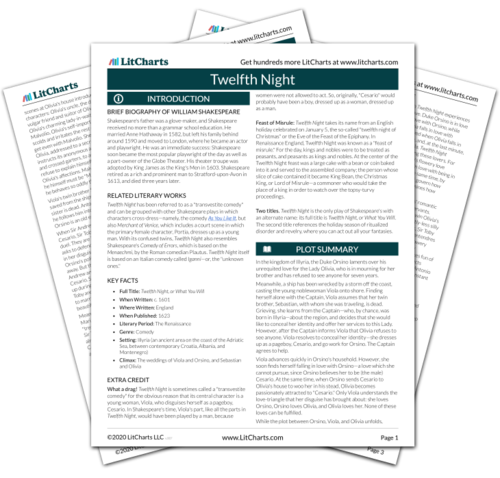 Welcome to the LitCharts study guide on William Shakespeare's Twelfth Night. Created by the original team behind SparkNotes, LitCharts are the world's best literature guides. A concise biography of William Shakespeare plus historical and literary context for Twelfth Night. A quick-reference summary: Twelfth Night on a single page. In-depth summary and analysis of every scene of Twelfth Night. Visual theme-tracking, too. Explanations, analysis, and visualizations of Twelfth Night's themes. Twelfth Night's important quotes, sortable by theme, character, or scene. Description, analysis, and timelines for Twelfth Night's characters. Explanations of Twelfth Night's symbols, and tracking of where they appear. An interactive data visualization of Twelfth Night's plot and themes. 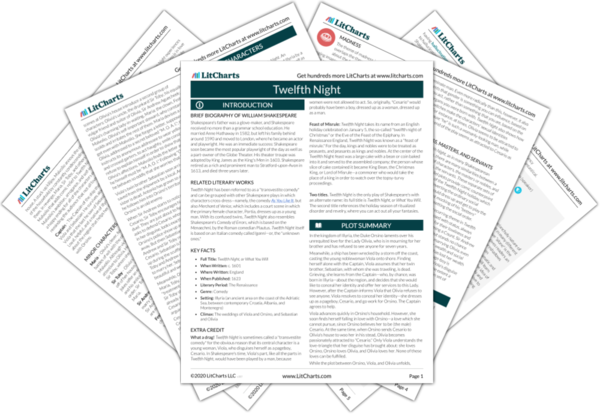 Get the entire Twelfth Night LitChart as a printable PDF. Twelfth Night has been referred to as a "transvestite comedy" and can be grouped with other Shakespeare plays in which characters cross-dress—namely, the comedy As You Like It, but also Merchant of Venice, which includes a court scene in which the primary female character, Portia, dresses up as a young man. With its confused twins, Twelfth Night also resembles Shakespeare's Comedy of Errors, which is based on the Menaechmi, by the Roman comedian Plautus. Twelfth Night itself is based on an Italian comedy called Iganni—or, the "unknown ones." What a drag! Twelfth Night is sometimes called a "transvestite comedy" for the obvious reason that its central character is a young woman, Viola, who disguises herself as a pageboy, Cesario. In Shakespeare's time, Viola's part, like all the parts in Twelfth Night, would have been played by a man, because women were not allowed to act. So, originally, "Cesario" would probably have been a boy, dressed up as a woman, dressed up as a man. Feast of Misrule: Twelfth Night takes its name from an English holiday celebrated on January 5, the so-called "twelfth night of Christmas" or the Eve of the Feast of the Epiphany. In Renaissance England, Twelfth Night was known as a "feast of misrule." For the day, kings and nobles were to be treated as peasants, and peasants as kings and nobles. At the center of the Twelfth Night feast was a large cake with a bean or coin baked into it and served to the assembled company; the person whose slice of cake contained it became King Bean, the Christmas King, or Lord of Misrule—a commoner who would take the place of a king in order to watch over the topsy-turvy proceedings. Two titles. Twelfth Night is the only play of Shakespeare's with an alternate name: its full title is Twelfth Night, or What You Will. The second title references the holiday season of ritualized disorder and revelry, where you can act out all your fantasies. Weigel, Moira. "Twelfth Night." LitCharts. LitCharts LLC, 22 Jul 2013. Web. 13 Jan 2019. Weigel, Moira. "Twelfth Night." LitCharts LLC, July 22, 2013. Retrieved January 13, 2019. https://www.litcharts.com/lit/twelfth-night.